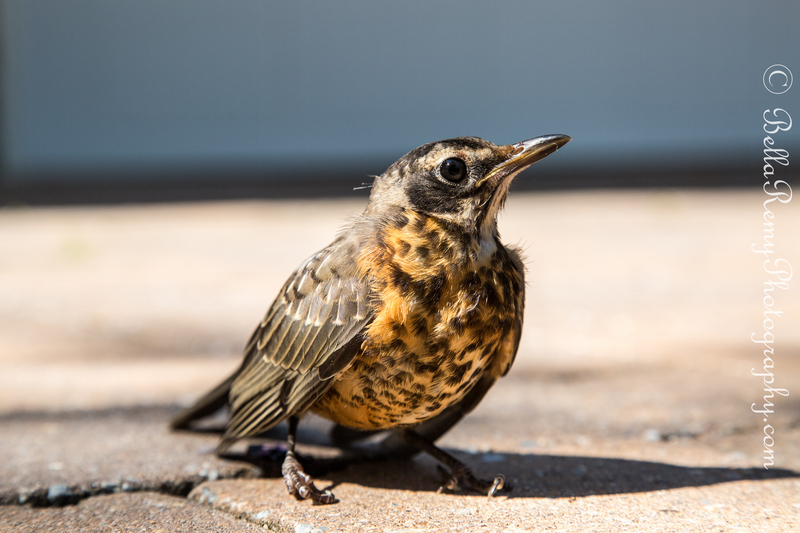 This juvenile robin was resting in my driveway mid morning. My parked car was not four feet from him. I needed to get into my car and move some things around. He just watched me walk to my car, open the trunk, close it, go to the side door open and close it. The whole time he didn’t move. I went and grabbed my camera that had the 24-105mm lens on. Laying on the ground I got about two feet from him to capture this uncropped image. I was starting to think something was wrong with him as his right foot was all curled up and the left wing was hanging. I asked him if I needed to help him any. He pooped some freshly eaten overly ripened Mulberries and scooted off. Guess he was just working off a slight buzz. Now THAT would have been something, wouldn’t it? Because I love playing with the camera, I love shots of photographers doing their work, getting to see the behind-the-scenes that went into a great shot like this one. Saty… Do you think maybe this little bird thot’ you were from National Geographic?? haha, drunk birds are the greatest! You’re awesome Ben ! Love the comment you gave Tricia. Had no idea that birds actually searched out the overripe ones. Too funny. How adorable! I do wonder if animals and birds react to fermentation like we do. I would guess yes. They totally do. At school, the mango and fig trees would get raided by lorikeets around the same time the fruits would start rotting. It wouldn’t be unusual to see the birds stumbling around the school grounds. I’ve heard that the birds seek out the fermented fruits, but not sure why or if it’s even true. Poop, what do you know. I like the texture of the feathers. Somehow when they are grown up, the feathers look so smooth. LOL ! You are funny ! I think I was so close we can see the detail. Thanks! I was looking for it, but I can’t see it. Only the crooked feet. I’ll go back and check it out again. Now that’s not very nice of them to do. Hope you scolded them. It’s a very funny story and a great photo. I may have to dig my drunken raccoon photo out just for kicks. He was a big hit on Facebook. I’m hard to find, so I found you. Very funny. A marvellous image too! I love the orange chest, such vivid colours! Thanks Fatima! Isn’t he cool looking? I love the speckles on his chest. I love it, I can’t stop laughing from the last bit. How nice of him, perhaps he heard you were a photographer and was wondering how long he was going to have to hang around before you took his photo. LOL ! You can see it right?? Crazy woman laying out in the driveway taking a bird pic. Surprised they didn’t bring the white jacket. Love your idea though about the portrait shot. Ok..so call me a crazy woman. I was totally talking to him and he was listening !! It was truly an awesome Kodak moment. Thanks! Oh what a precious babe you found – what a little lovely! Thank you so much Mary ! I felt truly blessed in his presence. Love the humour and the picture – I’m sure we have all felt like that at one time or another, however I doubt that we would have carried off such a lovely portrait, but perhaps that is due to the skill of the photographer?! Loved your post! !